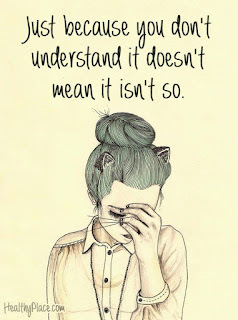 You Don’t Understand! Some things people with Anxiety and Depression want you to know. I’ve been a therapist for over ten years now. In a decade you hear a lot of things. A lot of the same things sometimes, but it’s also important to remember each person is a case study of one. A good piece of advice I once learned was to examine how a person was like all other people, how they were like some other people, and how they were like no other people. It reminds the person listening that every person you meet has their own unique story. But there are also some common themes. 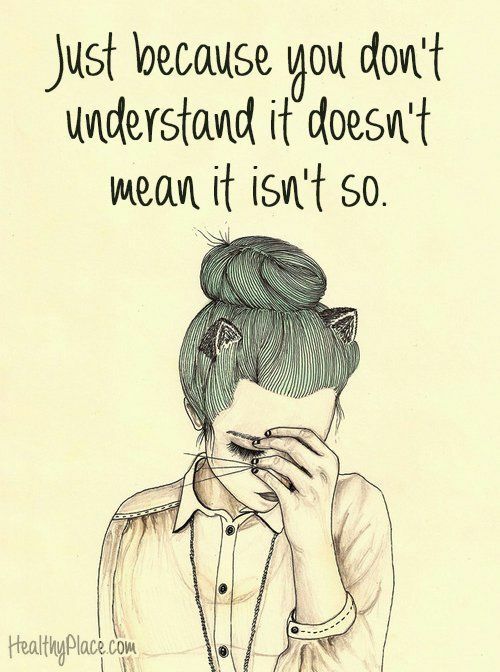 Some ways people have been misunderstood in their lives. Some false assumptions others sometimes have about them. Here are some of them I’ve heard a lot. When I cancel plans at the last moment, it’s not because I’m a snob or don’t want to hang out with you. My nerves have gotten the best of me and I had to stay home. You may be disappointed, but trust me that I’m even more disappointed in myself. There are things you take for granted that are incredibly difficult for me. Just going to the store can be a battle that takes me hours to prepare for. I pray I don’t run into anyone I know. Every word exchanged with the cashier is painful. For most, this is a mundane activity. For me it's a kind of torture. Talking to other people can be really hard for us. We’re constantly thinking of the right thing to say, and that makes us say the wrong things sometimes. Later we will go home and think about every misstep in the conversation, and this will fill us with shame. We’ll have lot of conversations in our heads trying to make it right again. We HAVE tried a lot of treatments. We’ve tried pills, doctors, and herbs. Therapists, yogis, and healers. We’re well aware of the issue, believe me. We appreciate you trying to offer helpful suggestions, but really they just make us even more self-conscious. We’re really not very uncomfortable inside our own skin. Think about how you felt on the day you took your driver’s test, or your wedding, or when you had to make a big speech in front of the class. Remember the racing heart? The cold hands? How you kept forgetting silly little things? That’s how we feel all the time. That’s why it’s hard to take advice sometimes. Our dials are turned way up all the time. When we’re physically that wound up, the smart, rationale, thinking part of our brain turns off. It’s called fight or flight. 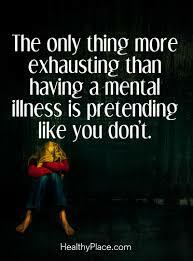 It’s totally different suffering with something that’s “invisible.” When people can’t “see” what’s wrong with you they often think (and even say) “It’s all in your head.” That’s true to a point. But that’s a big place for it to be!! When people say they don’t “believe” in mental health issues, it’s really hurtful and makes us feel like we don’t belong anywhere. So there’s a few. There are a lot more on the list, but those are some of the big ones. Each person’s individual demons might vary, but these are some of the battles. It’s not all bad news on the mental health front. More and more laws are being enacted around the world to ensure mental health is treated with the same respect as physical health. These kinds of laws aim to take some of the stigma away. Give people permission to talk about their battles without fear of disbelief and ridicule. They are a good start. But if you do have a person struggling with mental health issues in your life, be patient. They know something isn’t right, and sometimes they need a little understanding even when they’re not being very nice. They want to talk about it but it’s very hard. Embarrassing even.